Want to make next Christmas more enjoyable for families in need? Want to hold a Pyjama & Stuffed Toy Drive at your location? 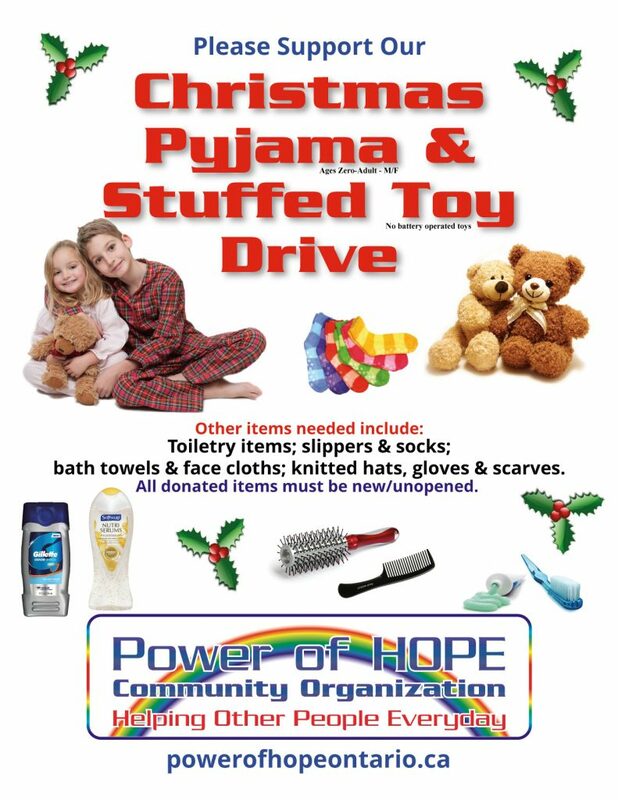 Holding a Pyjama & Stuffed Toy Drive is a great way to get involved, supporting Power of HOPE and helping families in need in our community of Waterloo-Wellington. We have created a poster (similar to the one on this page) that you can download and print. It has a spot to add the month you will be hosting your Pyjama and Stuffed Toy Drive. Then email us with your address and dates you plan to hold the drive and we will add your information to our website and on our Facebook page. We encourage you to wrap a large cardboard box with Christmas wrapping paper or decorations and place it in an accessible spot. Print off one or more of the posters and post in a visible location (or two), such as the entrance door or front window of your store or in the cafeteria at your company, as well as above your collection box. Once it is full give us a call and one of our volunteers will come to collect.